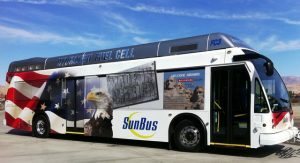 ElDorado National’s fuel cell electric buses (FCEBs), powered by Ballard FCveloCity-HD modules, have completed rigorous testing at the Altoona Bus Research and Testing Center under a program established by the Federal Transit Administration (FTA), Ballard Power Systems has announced. Furthermore, the ElDorado National FCEBs are now eligible for a $300,000 voucher incentive under the California Hybrid and Zero-Emission Truck and Bus Voucher Incentive Project (HVIP). The California Air Resources Board and HVIP are focused on accelerating the purchase of cleaner, more efficient trucks and buses in California, explains Ballard. The 40-foot Axess FCEBs are now available for sale with the substantial HVIP incentive in California. ElDorado National has previously produced 20 FCEBs at its Riverside, Calif., plant – all powered by Ballard – in collaboration with BAE Systems and under the American Fuel Cell Bus program. The latest version of ElDorado National’s Axess FCEB offers additional hydrogen storage, thereby extending the range beyond 300 miles.